Where do I find my Connect Order Form? Once you're logged into your Anow account, click your initials in the top right corner. 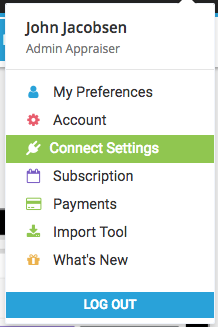 Select Connect Settings from the given menu options. Scroll until you see Order Form under the Connect Links header. Finally, click Copy or View. View will redirect you to the actual Order Form for your Connected Clients, and Copy will simply copy the given URL to your clipboard so that you can paste it and send it out in an email.